Ukuran pratayang PNG ini dari berkas SVG ini: 305 × 188 piksel Resolusi lain: 320 × 197 piksel | 640 × 394 piksel | 800 × 493 piksel | 1.024 × 631 piksel | 1.280 × 789 piksel. This is a retouched picture, which means that it has been digitally altered from its original version. 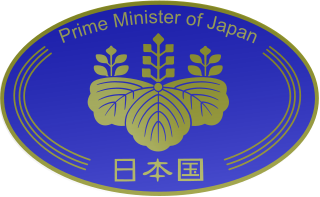 Modifications: SVG conversion (includes spelling error: Pime Minister instead of Prime Minister). The original can be viewed here: Emblem of the Prime Minister of Japan.jpg.